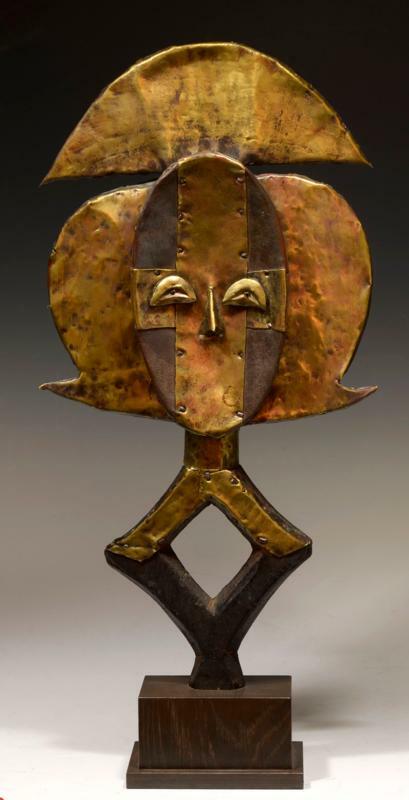 A classic guardian post for the bones of an ancestral basket; carved wood covered with copper sheets and tacks, typical form, abstracted facial features, sickle-shaped coiffure, neck merging to a rhomb-shaped handle. 21 inches L. + custom mount. Compare to Perrois, Louis, Arts du Gabon, Paris 1979, ill. 186. Provenance: Olivier Castellano, Paris France.